Orcinus: Pre-debate Tea Party Gathering In Greenville: Chock Full O' Nuts! According to [its] official program, the pre-debate “Freedom Rally” is sponsored by several extremist groups, including the Oath Keepers militia group and the radical anti-communist John Birch Society. You can see a picture of the program here. The rally also featured a cadre of high profile speakers, including Judge Roy Moore, the former Alabama Supreme Court chief justice who lost his job after refusing to remove a Ten Commandments monument from the state judicial building, and Nikki Haley, South Carolina's first female governor. She followed John Birch Society president John McManus, who equated neo-conservatives with socialists, and Greenville Republican activist Dan Herren, who urged the tea party to try to work within the GOP to make it more conservative. 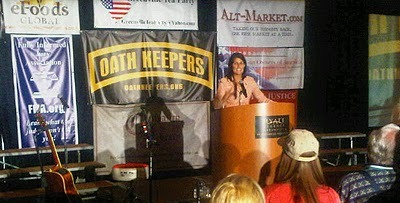 On top of that, she spoke with that huge Oath Keepers banner right behind her. That's one of the rally's chief sponsors -- and it's one of the most bizarre, paranoid and extreme -- not to mention potentially dangerous -- of the Tea Party factions. The Oath Keepers are also extensively involved in the Tea Party movement, having helped co-sponsor their national convention in Tennessee last year, as well as a host of local Tea Party gatherings, such as that full-bore Patriot gathering I attended in Montana. Then there's the John Birch Society -- whose paranoiac fantasies spun over many long decades have given birth to many of the paranoid fears trotted out by folks like the Oath Keepers and Alex Jones: they're the true godfathers of American right-wing extremism, and the true godfathers of the Tea Party movement as well. Rachel Maddow exposed them a little while back and they didn't like it one bit. That's too bad: after all, the Tea Partiers often betray their true Bircher lineage in polls, as well as in the overt agenda of their movement leaders. Indeed, movement icons like Glenn Beck promote Bircherite conspiracy theories on Fox News. In the past year, it seems, they've become mainstream Republican again. Which tells you just how insane the Right really has become.